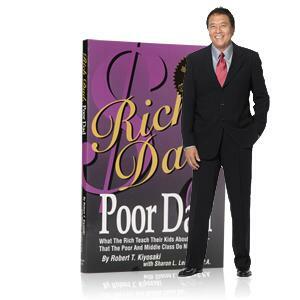 "The story of Rich Dad Poor Dad is really a story of two different fathers with two different sets of values and completely different sets of advice. So I don't mean to insult anybody or damage your values. Really that was the difference. For example, my poor dad always said, "Go to school, get good grades, get a high paying job, work hard, live below your means, save money, get out of debts, have a good retirement plan." Now that was my poor dad's values. My rich dad said, "You probably won't get rich doing that way because very few people got rich following that plan." 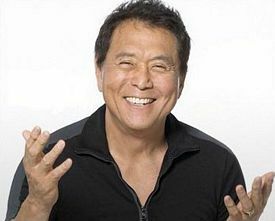 Robert Kiyosaki said, "When I was 9 years old, I went up to my father. My father, strange for Japanese, was 6 foot 4 inches, 220 lbs, a very large man. I am the smallest man in all of my family." "Dad, I finally figure out what I want to do for the rest of my life and what I want to be..." I said, "I want to be rich." He said, "Okay..." I said, "Dad, how do I become rich?" And he said, "What the rich know how to do is they know how to make money." I said, "Good." "So, I ran off... I got my friend Michael, he was my first business partner at age 9. We were both in school together, and we set out to make money. And our first business venture was... what we did was we ran around our neighborhood in Hawaii and we collected Crest toothpaste tubes back in the 1950s. In those days Crest toothpaste tube was made out of lead. Michael and I ran around and collected all these toothpaste tubes... Go to our neighbors, knock on their doors and say, "Would you mind saving your empty toothpaste tube for me?" They said, "Sure." One day my Mother comes home, there was this box next to the washing machine full of these ugly looking toothpaste tubes. And she was wondering what Michael and I, my first business venture, were up to. "So one day my dad drives up with one of his school teacher friends and he found me out there with this fire going, Michael and I melting down those lead tubes... And dad and his friend come over and look at what we were doing, and said, "What are you doing? What are you boys doing here?" And what we had done, we'd taken a plaster of Paris and we had put US coins in there. So we were pouring and popping out half dollars, quarters made out of lead. My father said, "What are you doing?" I said, "Doing what you told us. We're making money..." :) And his friend started laughing, he said, "Leave the boy alone, you might have a talent here..."
Number one: I'm a school teacher, and school teachers don't know how to make money. Number two: I'm Japanese. Japanese don't know how to make money." So, as I grew older, it got really difficult in my family because my dad being a school teacher would say, "Be good, study hard..." and I'd say, "Why?" He would say, "So, you can get good grades..." and I would say, "Why?" "So you can find a good job..." I'd say, "Okay, why?" And he'd say, "So you can find a good company to work for." And then I would go across the town, and talk to Michael's dad, and all he would say to me was, "You don't want a company to work for. You want to study hard to find out how to buy a company and sell it." "And it really caused a conflict in me. If you can imagine me being seventeen years old sitting in high school... It was true, I flunked out twice, not just once but twice because I was bored. I had a different educational background. And it was tough, like I said, with my two dads. Now, the reason I bring this up is how many people realize that America is in a fairly big financial crisis right now? ..."
"Rich Dad Poor Dad Seminar in 1996"